When we download an app and then we use the app, sometimes we deal with some problems. Those problems can happen because of some reasons. To fix the problem, it is better if you find the cause of the problem and then you can fix it based on the cause. Are you a user of KingRoot app? If so, have you ever experienced in a situation where you are asked to wait for the rooting process which says,” Please wait for the update patiently.” This message means that they have not yet added your device to their database. To fix it, you are able to follow the the options below. First, you are able to reboot the device and then try again. You can also search for the other options to root your phone. Alternatively, you are also able to wait and they may add your device in the list. The android version above 5.1 is not supported by KingRoot. The KingRoot version that you have downloaded is not the latest one so you need to try new version. Bootloader is locked by manufacturer so users cannot make any changes with the system with bootloader being locked. It can cause the rooting failure. To make your rooting process is successful, you are able to pay attention to these following things. Sometimes, this process can spend a long time. So, make sure your battery is full. Before rooting your device, do back up data to prevent from data loss if it fails to root. Make sure that you have download and installed the correct driver for your phone on your PC. Permit USB debugging on your android phone. Select a rooting method which is appropriate to your device. You are also able to download Root Checker to check whether your device is rooted or not after finishing the rooting steps. If rooting process goes wrong and then it results to other issues such as being stuck at rooting process, do not be panic. Some other users have reported that this app stop and stuck at 90%. If it persists more than 45 minutes, you have to consider the possibility that the rooting failed already. So, you have to hard stop the rooting by holding down “Home” and “Power” buttons together until the screen dims. You are also able to try android data extraction to restore android from unresponsive screen death problem. It is a professional app especially for solving android system issues. 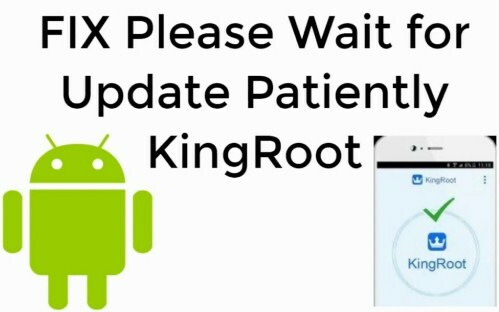 Related Post "Kingroot Waiting Root Request"